It's time for the 33rd season of Survivor and this season is full of marketing buzzwords. Survivor: Millennials vs. Gen X is a battle of young vs. old, a divide we've seen before. Let's hope it's better than the last time we had this split in Nicaragua. 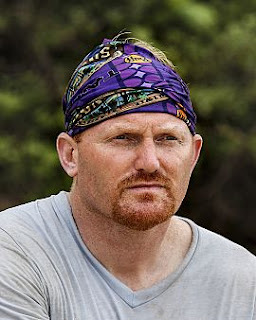 As I do every season of Survivor, I read the cast bios and watch their videos and try to predict the winner. I've come so close so many times... could this be the year? Reading Chris' bio, I wasn't impressed but when I watched his video I found his calm alpha demeanor as something that jumped out. I think he'll be a leader of the Gen X crowd that will be able to amass the numbers in his favor, sort of like Earl in Fiji. I imagine he'll bond with Bret the cop and they'll run stuff. Plus, Chris' job as a trial lawyer has probably made him a good communicator and, if he gets there, good at handling a jury. If a Millennial ends up taking control, I could see it being Adam who was my second choice as I have this vibe that this season will have a male winner. But hopefully my vibes are totally wrong because I really liked Figgy and Mari. I'm also obsessed with Zeke's video where he poses around a tree then rolls and poses in mud. Zeke is probably going to be my favorite, but sadly not my pick to win. But enough about my pick, who do YOU think will win Survivor: Millennials vs. Gen X? Cast your vote below in the handy form and you could win the glory (as well as the annual photo of a trophy).